Interleukin 6 (IL-6) is a cytokine with dual functionality, predominantly pro-inflammatory but also anti-inflammatory. The IL-6 family includes IL-27, IL-31, leukemia inhibitory factor (LIF), oncostatin M (OSM), ciliary inhibitory factor (CNTF), cardiotropin-1 (CT-1), cardiotrophin-like related cytokine and stimulating neurotrophin-1/B-cell stimulating factor 3 (NNT-1), and neuropoietin (NPN). IL-6 has two receptor versions; the membrane bound IL-6 receptor (IL-6R) is made up of CD126 and the universally expressed gp130 (CD130). 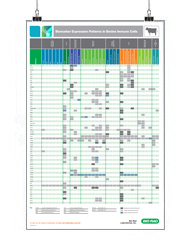 Only a few cell types have CD126 expression: hepatocytes, leukocytes and megakaryocytes. 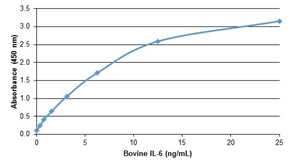 The soluble form of IL-6R captures IL-6, then binds cell surface expressed gp130. Signaling via the membrane bound IL-6R is called ‘classical’, while the soluble stimulation pathway is referred to as trans-signaling. It has been suggested that the latter is associated with inflammatory processes. Find our anti-IL-6 antibodies and associated protein controls for your ELISA assays listed below; links to experimental data and peer-reviewed publications can be found on each datasheet. Ivan E et al. (2017). Cytokine profiles of dendritic cells (DCs) during infection with bovine leukaemia virus (BLV). Pol J of Vet Sci 20(2), 221-231. Schaut RG et al. (2016). Bovine Viral Diarrhea Virus Type 2 Impairs Macrophage Responsiveness to Toll-Like Receptor Ligation with the Exception of Toll-Like Receptor 7. PLoS ONE 11(7), e0159491. Scheller J et al. (2011). The pro- and anti-inflammatory properties of the cytokine interleukin-6. BBA - Mol Cell Res 1813(5), 878-888. Tanaka T et al. (2014). IL-6 in inflammation, immunity, and disease. Cold Spring Harb Perspect Biol 6(10), a016295. Vordermeier M et al. (2012). The influence of cattle breed on susceptibility to bovine tuberculosis in Ethiopia. Comp Immunol Microbiol Infect Dis 35(3), 227-232.